Down with maintenance. Up with reliability. Maintenance has existed for as long as people have owned things they consider valuable. If an expensive piece of machinery breaks down, you’re not going to throw it away—you’re going to fix it. But if maintenance is such a fundamental part of the world we live in today, why is everyone sick of talking about it? 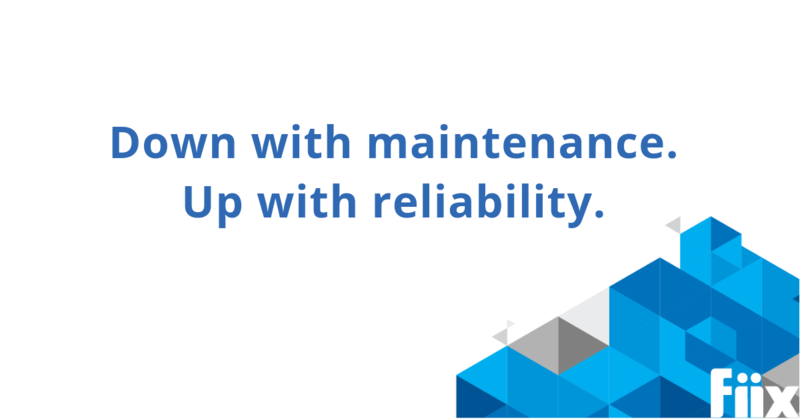 But wait—aren’t maintenance and reliability the same thing? Yes and no. While they’re both rooted in the same activities, it’s helpful to think of the latter as an evolution of the former. Maintenance has traditionally functioned as a one to one, technical relationship with equipment, where something is fixed when it breaks. Reliability culture, on the other hand, encompasses everything machinery interacts with: technology, culture, design, and maintenance strategy. It aims to achieve a more holistic approach that addresses the root causes of failures and builds long-term solutions to curb them. In short, the people responsible for caring for and extending the useful life of assets are shifting their thinking away from a reactive mindset and towards a proactive one. Maintenance has traditionally functioned as a one to one, technical relationship with equipment, where something is fixed when it breaks. Reliability culture, on the other hand, encompasses everything machinery interacts with: technology, culture, design, and maintenance strategy. It’s a shift that’s been taking place since the manufacturing industry began to embrace digitization. We’re in the midst of the fourth industrial revolution, known as Industry 4.0, which has made it possible for the Internet of Things to connect machines and use data to better plan and understand maintenance operations. With that change in place, the idea of reliability has become much more prevalent. What is reliability culture, exactly? If reliability refers to the practices put in place to proactively extend the useful life of an asset, then what does reliability culture entail? According to Bruce Wesner, former Managing Principal with Life Cycle Engineering, reliability culture comes down to assigning asset ownership. Since operators are the ones interacting with machinery day after day, they should act as the asset owners. This also puts the onus on operators to make sure their asset is running as expected, and that any future preventable breakdowns can be addressed and stymied. This is where a strategy of total productive maintenance (TPM) becomes very useful. As a reminder, TPM embraces the philosophy that everyone in a facility should be responsible for maintenance. According to this strategy, a 5S foundation will help introduce the processes and standardization needed to allow operators to start thinking about machinery as something that needs to be continually assessed, inspected, and cared for. Once operators are performing the activities necessary to lay the groundwork for TPM, management can begin to instil a true TPM framework by setting up activities that support the eight pillars of TPM. Larger projects, like implementing a CMMS, formalizing a TPM mission and vision, and performing reliability audits, will help keep reliability at the forefront of everyone’s mind. As Industry 4.0 gains steam, so to speak, setting up a reliability-focused culture will only become easier. The knowledge provided by connected machines and smart data will allow facilities to move into a truly predictive maintenance mode, where reactionary “maintenance” is left in the past and planned, proactive, reliability-focused work is the norm.